South African anti-apartheid revolutionary, politician, and philanthropist, who served as President of South Africa from 1994 to 1999; Nobel Peace Prize Winner (1918-2013). Signed colour photograph. no place. 180 : 130 mm. With a copy of the original letter of transmittal. Nice head and shoulders portrait of the two South African politicians shaking their hands after their 1994 election. It is very rare to have both signatures on one sigend photograph. - He was the country's first black head of state and the first elected in a fully representative democratic election. His government focused on dismantling the legacy of apartheid by tackling institutionalised racism and fostering racial reconciliation. Ideologically an African nationalist and socialist, he served as President of the African National Congress (ANC) party from 1991 to 1997. A Xhosa, Mandela was born in Mvezo to the Thembu royal family. South African anti-apartheid revolutionary, politician, and philanthropist, who served as President of South Africa from 1994 to 1999; Nobel Peace Prize Winner (1918-2013). Signed colour photograph. no place. 180 : 130 mm. 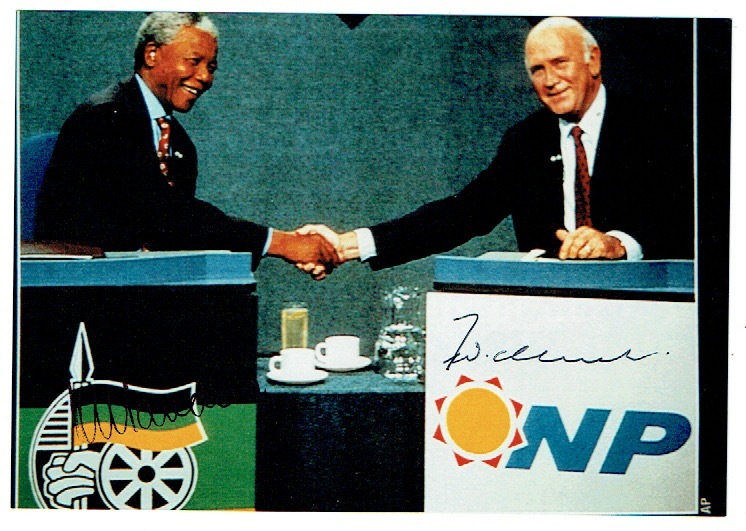 Nice head and shoulders portrait of the two South African politicians shaking their hands after their 1994 election. 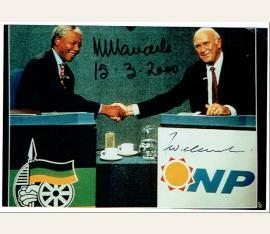 It is very rare to have both signatures on one signed photograph. 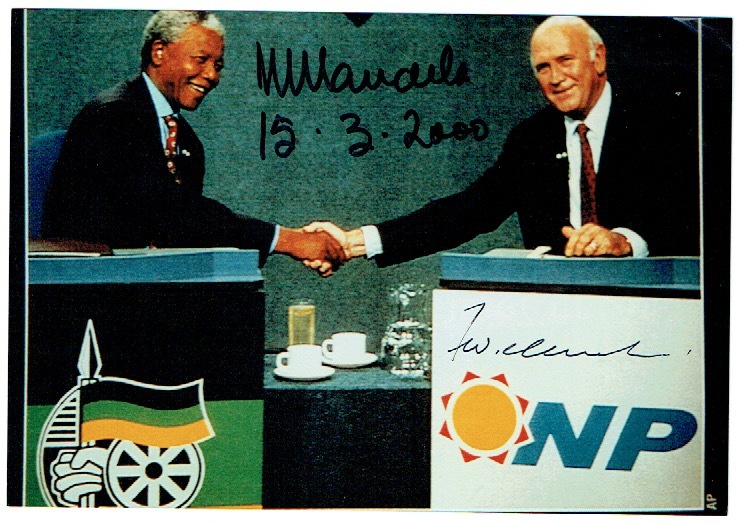 - Mandela’s signature in the darker portion though visible. - He was the country's first black head of state and the first elected in a fully representative democratic election. His government focused on dismantling the legacy of apartheid by tackling institutionalised racism and fostering racial reconciliation. Ideologically an African nationalist and socialist, he served as President of the African National Congress (ANC) party from 1991 to 1997. A Xhosa, Mandela was born in Mvezo to the Thembu royal family.